To me nearlyfreespeech is a risk-free approach, you buy a domain name at about $9.00 and then starts creating your blog, if it doesn’t work out, stop paying nearlyfreespeech and you’re done. If it does work out, and you find yourself running a blog that racks in 50,000 to 100,000 hits per month, then you can switch to someone like dreamhost or bluehost, then it’d make sense to go for a flat fee model, because only then would it be cheaper. Trust me, switching webhost isn’t anywhere near as difficult as you think, and you can even keep your domain registered on nearlyfreespeech but your blog hosted on a separate webhost. In truth, I worked out how much hosting with nearlyfreespeech really cost in a separate post, and came up with a $3.60/month price tag. This was back in Sept 2011, and since it’s been a year since I started this blog and traffic has increased (albeit slightly), I’d thought I’d repeat the exercise to give you a good indication of how much it’ll cost as your traffic increases. 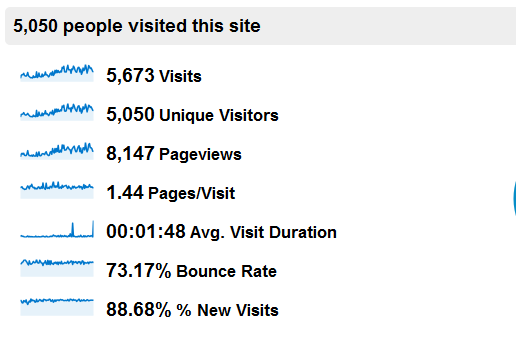 So from the 01-Jan-2012 till 01-Apr-2012, I’ve had 5,050 unique visitors who then created 8.147 pageviews. When counting bandwidth cost, it’s more accurate to look at pageviews rather than visits because 1 visit could result in a lot of bandwidth particularly if that visit had many pageviews. This of course isn’t much to shout about, but I’ve always maintained that I’m growing the traffic slowly (very very slowly). 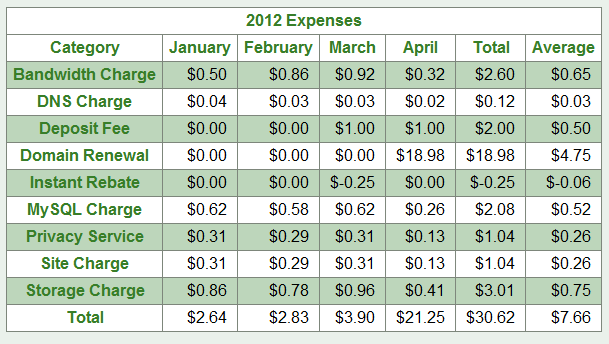 Now that $7.66/month looks like a lot, but I’d just renewed my domain for 2 years costing me $18.98. Take the $18.98 out of the equation and count only the first 3 months (April isn’t over yet), and we end up with $9.37 for 3 months or a monthly average of $3.12. That’s way lower than what most fixed fee webhost charge you, and definitely cheaper than the $4.95 bluehost charges you for the 36 month contract or the $6.95 per month I’m paying dreamhost. To be fair, though, these charges include the privacy setting, which most other webhost consider an add-on, so in fact nearlyfreespeech could be even cheaper but I’ve chosen to ignore that cost. More importantly, nearlyfreespeech charges for domain renewal, whereas other webhost give out free domain renewals as long as you subscribe to a yearly contract. So if we include the domain renewal cost, aggregated out over the 2 years, domain cost by itself is about $0.40/month from nearlyfreespeech. Add this to the $3.12 average cost and we have a total hosting cost of $3.51/month. That’s pretty cheap :), but my website is a pretty low traffic one, so you have to do your own calculation. It’s also only a dollar off from bluehost 36 month contract. $3.51 isn’t much different from the $3.60 I calculated in the previous post, and it appears that even though I’m adding content and getting more hits, the prices aren’t shooting up as high as I’d thought. The reasons behind this maybe the fact that I’ve switched to cloudflare and cleanedup most of my storage. That being said, based on this, unless your website is raking in more than 1,000 hits/day, I’d say don’t worry about the hosting charges…yet! Nearlyfreespeech is also a pretty striped down web host, they don’t have the bells and whistles of other webhost who include ‘one-click installs’ for wordpress and Joomla. So with Nearlyfreespeech, you really have to learn how to install these things on a Unix server with PHP. It’s a good thing to learn, and I’d recommend starting with nearlyfreespeech rather than starting with a webhost that ‘hides’ these technicalities away from you. These skills, while not mandatory for blogging are pretty good to have. You know I’m a fan. I’m trying to make you fan. Nearlyfreespeech doesn’t have a referral program, unlike dreamhost. So if you want to suppory my dreamhost account, you can head on over to dreamhost and register for a new account using the KEITHROZARIO promo code to get a $90.00 dollar discount. That discount while significant, would also net me $7.00 dollars. My recommendation of Nearlyfreespeech however, comes at with no strings attach, I don’t make any money and I’m not in any way motivated to recommend them to you, other than the fact that I absolutely enjoyed their service and would like other bloggers to experience this as well.